If you were to go out and map a paddock at 11am and then again at 2pm, the resulting pixel values would be different. Even using the Normalised Difference Vegetation Index (NDVI) which by definition gives a normalised value, the data will be different. This is probably because the atmosphere and clouds do not seem to block/transmit/reflect wavelengths in parallel amounts.We see this effect in satellite imagery where the image is affected by cloud shadow. The table below is pixel value of Red and NIR from two points in the same barley paddock that has minimal variability. Despite crop growth activity and biomass being very similar, these areas produce significantly different NDVI value due to the cloud shadow. This can be applied to UAS imagery. The atmosphere, clouds and sun angle is constantly changing throughout the day affecting reflectance of all wavelengths differently. Therefore for data to be compared like to like it needs to be calibrated. This section follows on nicely from repeatability. If data is going to be used for more than just scouting then some sort of calibration will need to take place. As discussed in a previous blog post, calibration of NDVI could be potentially be achieved using an active ground device such as a GreenSeeker. There is also the new payloads that are true multispectral and have upward looking sensor to measure irradiance which could be used to calibrate data for true reflectance. Other forms of calibration/ground truthing include biomass cutting and weighing, tissue testing, the list goes on. Users of NDVI have tended to estimate a large number of vegetation properties from the value of this index. Typical examples include the Leaf Area Index, biomass, chlorophyll concentration in leaves, plant productivity, fractional vegetation cover, accumulated rainfall, etc. Such relations are often derived by correlating space-derived NDVI values with ground-measured values of these variables. This approach raises further issues related to the spatial scale associated with the measurements, as satellite sensors always measure radiation quantities for areas substantially larger than those sampled by field instruments. Furthermore, it is of course illogical to claim that all these relations hold at once, because that would imply that all of these environmental properties would be directly and unequivocally related between themselves. Thankfully we are not pigeon-holed to NDVI. Agribotix claim they get better results using the Difference Vegetation Index (DVI). Another example is Soil Adjusted Vegetation Index (SAVI). Without ground control points, the positional accuracy of data will be mediocre at best. Expect XY accuracy of a few meters and even more on the Z axis. GPS will record the position each frame is captured (+/- delay error), but the pitch, yaw and roll of the UAS which affects how the image is framed on the ground, is determined by an inertial measurement unit (IMU). The quality of the IMU will have a bearing on the positional accuracy if the processing software takes these variables into consideration. Expect to have to lay out minimum of 4 ground control points for high accuracy data. As a consequence of the process involved in collecting data with a UAS there are several factors that contribute to the ability to reliably collect data. The process usually involves the UAS following a set lawnmower style track, conducting swaths up and back as it moves across the area of interest. As the vehicle is flying, it is capturing an image every few seconds depending on its speed. A forward and side overlap greater than 50% is required. Although processing software can handle images with some angle to the ground, extreme pitch and roll will affect the overall product. In the data collection process if the UAS is hit by a gust of wind, it may put 2 or 3 images off target, while the autopilot makes adjustment. This can lead to a hole in the data set. This is not uncommon. Some UAS manufacturers allow you the rapidly transfer the raw data off the vehicle to a laptop in the paddock to check data coverage and quality in field (e.g. Precision Hawk). So remember when someone claims their machine can fly in high winds, it is probably true, but the quality of the data being collected may not be of much use. Reliably collecting the data is just the first step in the process. Once all these images have been collect they need to be stitched together. It is amazing that stitching 300+ 12MP images together which are all taken at slightly different angles to the ground is even possible. Even more so that 3D surface models can be constructed from these 2D images. Given the complexity of this task it takes large amounts of computer power and time (think several hours for 100ha). For this reason there are several cloud based platforms which can offer this service (e.g. DroneMapper and PrecisionMapper). Processing on your own desktop computer versus online services do have both their pros and cons. A downside to the cloud services is the internet bandwidth required to first transfer the raw data to the server and then retrieve it once it has been processed. A downside to the desktop solution is the upfront cost of hardware and software and the required skill set may not be available in house. Once the data is processed it needs to be stored somewhere and somehow distributed. Often one scene can be more than a gigabyte. If the processed data is not cut into tiles it can require a powerful machine just to view it. This is where online solutions come into play. Again the same issues exist as above around bandwidth requirements. At some point if the data is going to be used for more than just looking at it will most likely need to be transferred onto a local machine. This is an online map of one of the first areas I mapped with my DIY Finwing Penguin UAS. If for some reason the data is to be printed, it needs to be formatted as such which takes time and software. 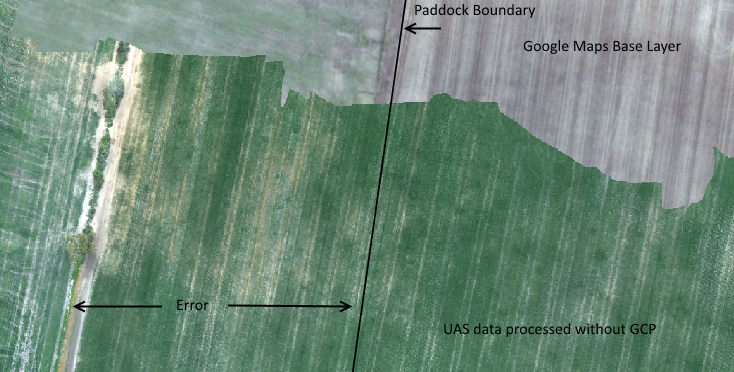 Integrating data generated from UAS into existing precision agriculture software should be possible but not likely in its highest available spatial resolution. 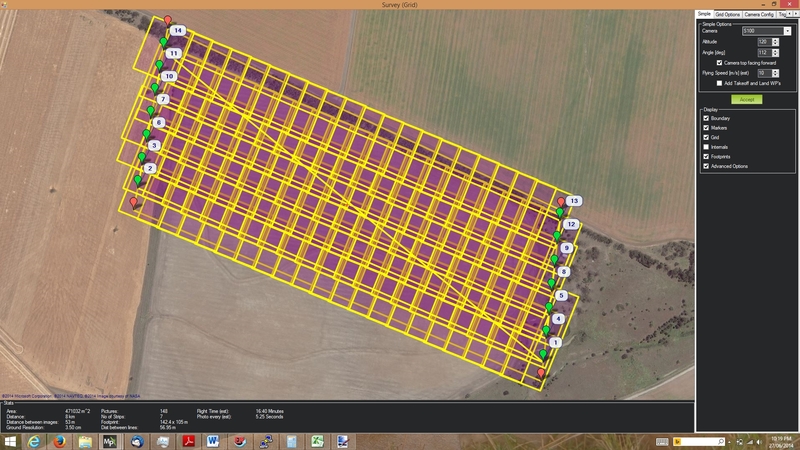 Software such as Farmworks and SST were not designed for such intense data sets which are able to be generated from UAS sensors. Resampling data to 0.5m resolution may be required. A whole other post could be written on this but basically in Australia we have the Civil Aviation Safety Authority (CASA). They require anyone who wants to fly UAS (they call them remotely piloted aircraft or RPA) commercially to have an Operators Certificate and Controllers Certificate. This, among other things requires a theory component equivalent to a private pilots license, comprehensive manuals written, and a stringent approvals process to ensure your vehicle is fit for service and your piloting skills are sufficient. CASA is at the moment reviewing this process and should hopefully have a revision out by the end of the year. This process seems strict, but it important to keep the UAS industry safe and professional.